Memory Lane Friday is a chance to write about your memories to preserve them for your family. Everyone is welcome. This week's topic is "A Ceremony". Paul and I met during Welcome Week at Baylor. I didn't expect to meet anyone so soon, and I definitely didn't expect to meet the person I'd later marry. In fact, I never really saw myself as marriage material. We stuck though. And by early junior year we were engaged. At some point, the summer before senior year, we decided to just go ahead and get hitched. We knew this was what we planned to do. So why wait? Certainly, having never thought I'd be married, I'd never had any grand wedding delusions. I just wanted a simple ceremony with a few friends. So that summer we decided to wed in August. Not everyone was as supportive as we would have expected. And there were a few way off the mark questions about whether I was knocked up. But we proceeded despite those things. Like I said, I didn't want a big wedding. I love attending other people's elaborate weddings, and have enjoyed participating in a few as well. But that just wasn't right for me. I picked out a pattern for my dress, sent it to my mom in Virginia, and she made it. I searched all over Texas for strappy silver shoes, and finally found a pair in Dallas. We called the people we wanted to invite - I didn't want invitations or receptions or announcements in the paper. I didn't want stress. So often, weddings cause people so much stress and cost so much money. I didn't want or need any of that. We really liked the Assistant Pastor at the University Church, so he did a few premarital counseling sessions with us prior to holding our ceremony. 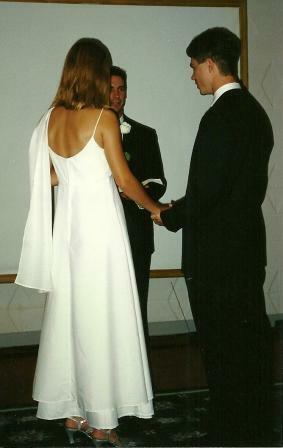 And so, on August 7th, 1996, Paul and I were hitched. Other than Paul insisting on placing my wedding ring on the wrong hand, it went smoothly. 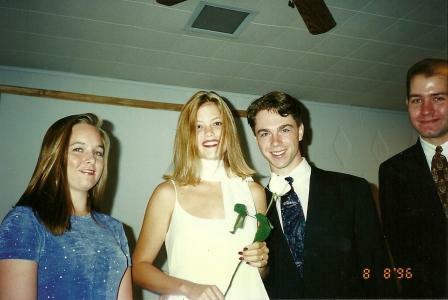 I sported a dress I still love, my strappy silver heels, and some very fake blond hair. Loads of bird seed, coming our way. This is my favorite of our wedding pictures, because it is candid and we look so happy. 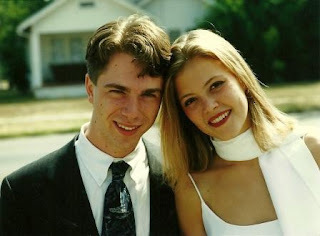 All of our wedding pictures, incidentally, were taken by friends and family. My goodness we were young. Doesn't Paul look nice with his face shaved? I keep telling him that. He doesn't seem to care though. He's had that beard thing going on 2-3 years now. Sigh. If you agree that Paul should shave his beard, PLEASE COMMENT! It can be like a bloggy petition! ;-) Sorry, I digress. Carrying over the threshold of the used-to-be-projects remade into college student apartments. Hmmm. Even though they were remade, they still kinda looked like projects in my pictures. Friends decorated our car. They did a thorough job, don't you think? 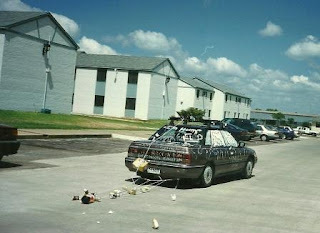 We headed off on our honeymoon and our first stop was a gas station to try to clear off all the cans and boxes and string. Looking back, would I change anything? Would I have waited or had a bigger wedding? Nope. It was just right for us. And I remember the day fondly. Want to join in on Memory Lane Friday? It's easy. Grab the code beneath the button. Copy and paste it into your blog. Be sure to come back next Friday. The theme is "This one time, at camp". Also, if you have a theme you want to see, let me know! Fun to read and see the pics! You truly haven't changed much!! Now I want to see a current day pic of your hubby . . . .
What a happy happy day! I think he looks okay with a little bit of a beard but not a lot. Keep in under control. LOL, great catch, Meredith! You are right, of course. Too funny. What a great memory! I love your dress. One of my new favorite posts! What a fun day that was. Anyone who snubs their nose at the small ceremony should just be glad we didn't elope. Plus I still love you and that's all that matters! My vote is for the beard. First of all it gains me entry into the unofficial Roanoke Bearded Bureaucrats Club. Secondly, I think it's a requirement to have a beard if you live in Franklin County. Thirdly, I'm horrible with a shaver. You look beautiful! 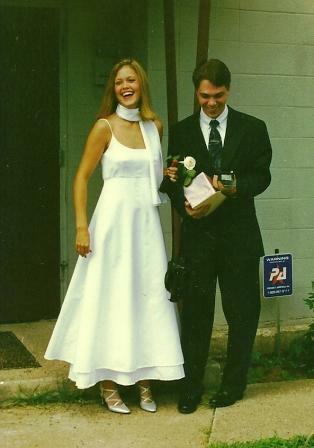 We had totally opposite weddings, but maybe I'll find a pic from mine and post it soon. ;) What a sweet memory, and a beautiful couple! Great story! I love wedding stories and I love the photos. You look beautiful in your beautiful dress! I prefer a clean shave on a man, too. Now where did you get married again? I didn't know there was any place in the US where 12 year olds could get married! it occurs to me that you might think ill of me...you don't look like an old lady now or anything...just like you are out of jr high school! LOL, Warren, I'll take it as a compliment, particularly since I turn 35 next month and am already stressing the (ironically) more challenging racing age group. Wow, Lisa....you were such a beautiful bride!!!!! Just stunning! !